Topics: Timeline, Discounts, Monetary Gifts, Etiquette, Checklists, and Find A Venue. the-irish-path.com The Irish Path, a journey to discover the ways of the Irish. 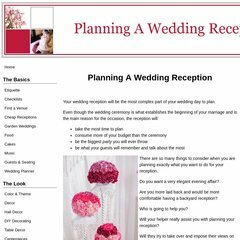 A-wedding-reception.com's server IP number is 66.43.56.36. Its 2 nameservers are ns2.sitesell.com, and ns1.sitesell.com. Sitesell Inc (Quebec, Montreal) is the location of the Apache server. The server is faster than 41% of measured websites, at 2641 milliseconds.